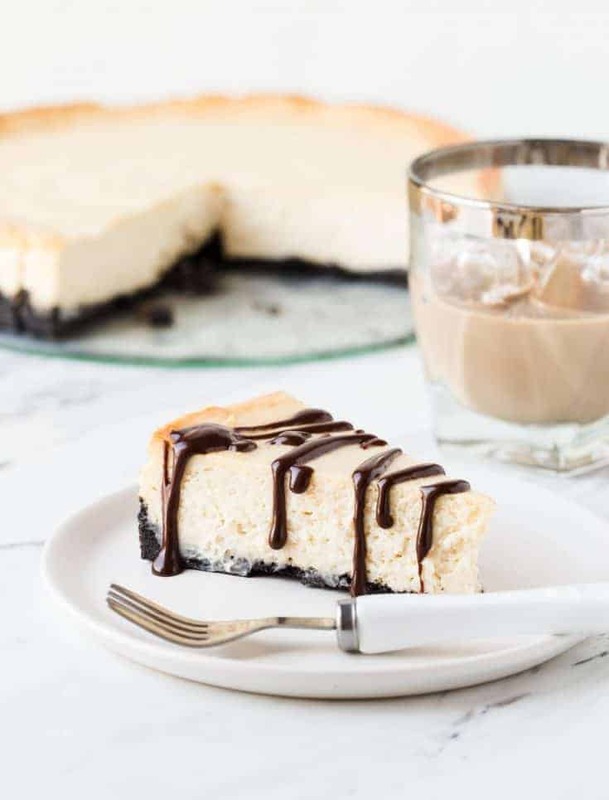 Cheesecake has long been a favorite dessert of ours, and this Irish Cream Cheesecake recipe with Chocolate Sauce has quickly risen to the top of the list. It’s International Whiskey Day and that calls for a celebration! What better way to celebrate than with a killer dessert? 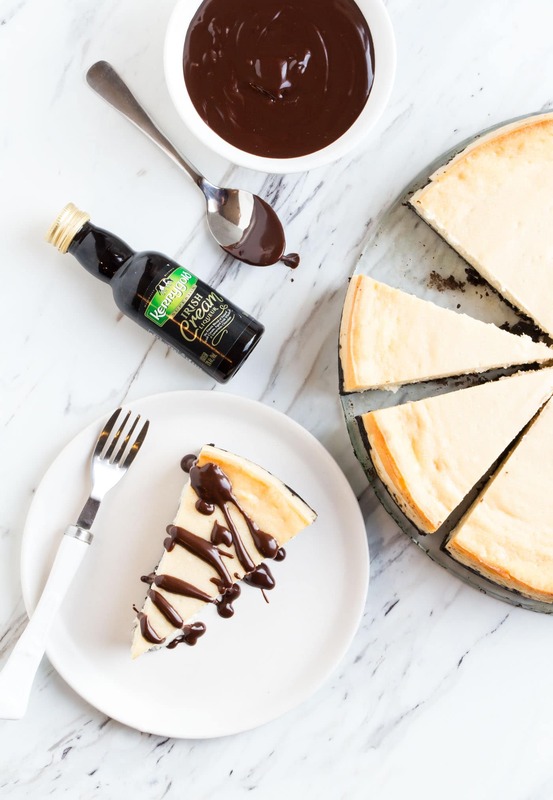 And the luck of the Irish is on your side because you get a double dose of Kerrygold goodness in this Irish Cream Cheesecake Recipe – first in the cheesecake and then again in the chocolate sauce. Have you tried Kerrygold Irish Cream? It’s a deliciously balanced blend of Irish Cream, Aged Irish Whiskey and a hint of chocolate. Even if you aren’t a whiskey drinker, this liqueur is perfection in a glass. But more than that, it’s also great to bake with. It takes a plain cheesecake and adds the just the right amount of velvety richness. We went the extra mile with this recipe and also added a bit of Kerrygold Irish Cream Liqueur to the chocolate sauce to give you a double dose of Irish Cream goodness. Feeding a group? Cheesecake is a great dessert for entertaining guests. It has to be made ahead of time, which gives me more time on the day of the party. Plus because it is so rich, one cheesecake can feed a lot of people. Baking cheesecake might seem intimidating, but if you follow these easy steps, you will get a picture-perfect cheesecake every single time. Make sure that the ingredients are room temperature before you start. This helps the cream cheese mixture stay smooth and creamy without having to overbeat it. Use a water bath. Now I cheated a little on this and put my cheesecake on the middle rack of the oven and put a cake pan filled halfway with boiling water on the rack below. This gives the same effect without having to worry about water seeping into my crust. Let it sit in the oven after baking. Don’t be in a hurry to get this cheesecake out of the oven. After preheating your oven, bake it for 55 minutes and then turn the oven off. Keep the oven door closed and let it rest in the oven for another hour. The end result? A restaurant-worthy cheesecake that is rich and velvety smooth – without any cracks! Drizzle generously with chocolate sauce and serve proudly. Baking Tip: This silicone springform pan is life changing. Never worry about the side of the cheesecake sticking to the pan again. If you don’t have one, I can not recommend it enough. In a small bowl, mix together chocolate cookie crumbs and melted butter. Press into bottom of springform pan and set aside. Place the cream cheese in the bowl of a stand mixer and beat on low speed until smooth and creamy. Add eggs one at a time, beating on low speed after each until just combined. Scrape down the sides of the bowl after each. Add sugar and beat on low speed until creamy, about 2 minutes. Add sour cream and Kerrygold Irish Cream Liqueur and beat on low speed until combined. Pour filling into prepared springform pan. Fill a baking dish halfway with boiling water and place on lowest rack of oven. Place cheesecake on middle rack of oven and set timer for 55 minutes. Turn oven off and leave cheesecake in oven for one hour. After one hour, remove cheesecake from oven and cool completely on a rack. Wrap and chill for at least 4 hours. Heat whipping cream on stove until hot, but not boiling. Add chocolate chips and stir until melted. Add Kerrygold Irish Cream and whisk until blended. When ready to serve, slice cheesecake and drizzle with chocolate sauce. Disclaimer: This post was sponsored by Kerrygold. We only share products with you that we love and use all the time. Thanks for supporting the companies that make Garnish with Lemon possible.